This week over at Inka Dinka Doodle the letter for Sunday Stamps is 'E'. Once again you could either use a set that begins with 'E', or you could do something that is good for the 'e'nviroment. I only have 1 set that begins with E, so I decided to see what I could come up with that would fit under good for the enviroment. I love,love,love Christmas and Christmas cards(if you have been to my blog before this wont come as a shock to you,hehehe) and have a tendency to hold onto cards for yrs. I went through my stash and found some old snowman Christmas party invites that we had used back in the late 90's/early 2000's, when we were living in CT! 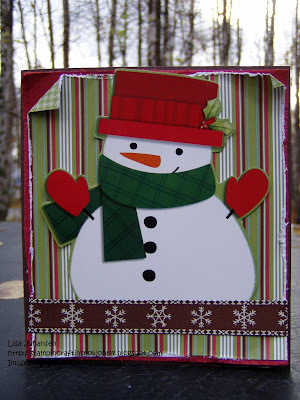 I took the invites, cut the snowman out and adhered it to cardstock to make a new Christmas card for this year. 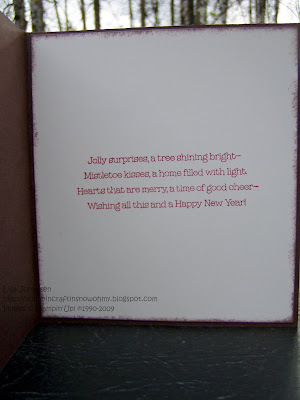 I recycled :0) and plus its a nice, easy card that would be great for mass production, which I think I just might do since I have several of these invites left! Great Job with the Recycling!!! He is an adorable Snowman! !